Leyton Orient boss Russell Slade says failing to score in the first leg of the Johnstone's Paint Trophy southern final could cost his team. Orient were beaten 1-0 by League Two side Southend after finding Shrimpers goalkeeper Paul Smith in fine form. Slade told BBC London 94.9: "We created enough to get ourselves a couple of goals but unfortunately we have not. "It was a really frustrating night for us. We trail now and it makes life very difficult for us." He added: "Paul Smith was well worked, made some good saves and kept them in the game." 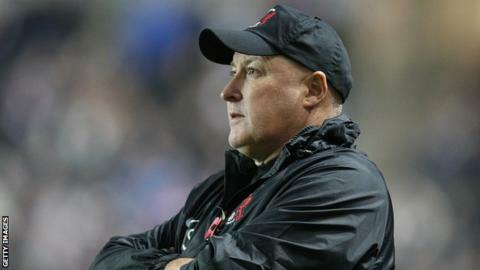 Despite defeat in the first leg, Slade remains hopeful of booking a trip to Wembley in the return leg. "It didn't go our way but there is still a lot to play for," he continued "We are now the underdogs. "They have got an advantage and are at home. They might think the job is mainly done but I think it is far from over. "We are still well in the game and even if we are trailing with 15 minutes to go, anything can happen. We will try and take it to the wire."